School Dances are one of the things we do best at DJ4U. We can provide a great mix of clean music along with a high energy light show to allow your students to have a great time! Request more info today on having DJ4U at your dance in Peoria, Bloomington or Springfield! When we say we're taking over your school...we mean it! At DJ4U, school dances are one of the things we do best. Our high energy DJs are young, fun, and interact with your students. The music, the lighting, the energy and the awesome club feel put energy on the dance floor and fun into your student body! Don't just take our word for it. Many schools like Pekin High School, Morton High School, Canton High School, Illini Bluffs, Ingersoll Middle School, Metamora High School and others book us to entertain at all of their school dances each year. Our reputation in schools is proven. Every school we have ever performed at has asked us back to do more of their dances. DJ4U is one of the first DJ companies in the nation to do something about the dirty music that is coming out today. We helped form the DJ Advisory Network for Content Evaluation to decide what songs are not appropriate to play in K-12 Education settings. We know that some songs on the radio are not appropriate to play at school and we promise to do everything in our power to keep your dances clean. The Illinois Association of Junior High Student Councils (IAJHSC) trusts DJ4U with their entertainment every year and you should too. We even have an A+ rating with the Better Business Bureau so you know you can trust our company. Our school dance package is designed to create excitement in your student body. 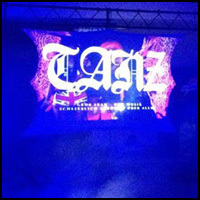 We bring nightclub style lights, lasers, concert style sound and so much more. Plus... we offer some great additions to the party that you can add on to our normal school dance DJ service. We know that schools are on a budget and that's why our pricing is designed to be affordable. We base all of our school pricing on the size of school and number students you'll be having at the party. We work very hard to ensure a great time for your students at a price that won't break the bank. Just request info from us to learn more about pricing for your school. If you're looking to step your school dance game, you should consider our Velocity School Events. We bring our mobile dance club for teens to your school and transform your gym or ballroom into an experience like you've never seen. You can learn more about Velocity events for your school at VelocityParty.com. Excite your student body by showcasing the most popular music videos available on our giant video screens. We’ll show the hottest music videos available (all edited for bad content) alongside our dance floor lighting show. We have high powered concert style black lights that can make your entire student body glow! We can provide glow merchandise, glow bracelets and more for your next dance. Wether you do a "White Out" theme and have your students dress in all white, or if you host a "Glow Party" where students wear neon colors... we can make them shine with our professional black light equipment.